Published in the South Kent Gazette, 19 November, 1980. The Dover water supply, from the adoption of the Public Health Act in 1850, until 1970, was municipally owned. In early times Dover had plenty of pure water, both from the River Dour and from, springs, which are to be found all over the valley. Nearly every important house in ancient Dover had a well; and, according to old deeds, when the land was mainly held under the Corporation, houses that had no wells had the right of taking water from the wells of their neighbours. In later times, there were public wells and pumps, including the Market Place pump, Lady-well pump, Charlton Green pump, and the Red pump at their Pier. As Dover grew more populous, although there was “water, water, everywhere,“ there was not a drop fit to drink, owing to the wells being closely associated with the soakage of cesspools. At that time, Dover’s necessity became the opportunity for water speculators. Mr. Walker, at the Oil Mills in Limekiln Street, established the western water works, having reservoirs in the cliff caves. There were also the eastern water works, established by the Gas Company, taking its supply from a well near Trevanion Street. The Round Tower, on the top of Priory Hill, which gave the name to Tower Hamlets, was also built for the purposes of a water supply. As none of these sources fully met the public needs, Mr. Walker, about the year 1850, purchased, from the Crown, the triangular piece of land on the side of the Castle Hill, now occupied by the Dover Waterworks, with the intention of forming a company to supply the town; and if that had been done, Dover would have been subjected to a perpetual water tax, which, for a long time, was inflicted on Folkestone, Canterbury, and some other Kentish towns. Dover, at that time, needed not only a good water supply, tout also a system of drainage, and the Corporation, after much discussion, resolved to boldly grapple with the difficulty, by carrying out, in one scheme, a thorough system of sewerage and a Municipal water supply. Under those circumstances, Mr. Walker, having no special us© for the triangular piece of land off Connaught Road, sold it to the town for £850. A tender was accepted from Mr. R. Panling, of Upper Kensington, for sections of the work at the following prices: Levelling and embanking the water works site, £700; making a covered reservoir, £1,343; constructing the pumping establishment, £2,616; and laying the water mains, £2,205; making a total of £6,864. The work ultimately cost more, owing to the failure of the contractor, in January, 1854, after he had been at the work about six months. Mr. William Moxon took up the work in March of the same year, and completed it. To reach the water supply, two wells were sunk, about 220ft. deep, and headings from the bottom were driven out to intercept the springs, one ten yards to the north-east and another a hundred yards to the west-south-west, the most copious supply being tapped by the latter, derived from the slopes above the Dour and Alkham Valleys. The yield of these wells was estimated at 5,000,000 gallons per week. To pump this water, two single-cylinder beam engines of 30 horse-power each, were erected by Messrs. Simpson and Co. of London, and when new they were deemed to be capable of raising 55,000 gallons per hour. 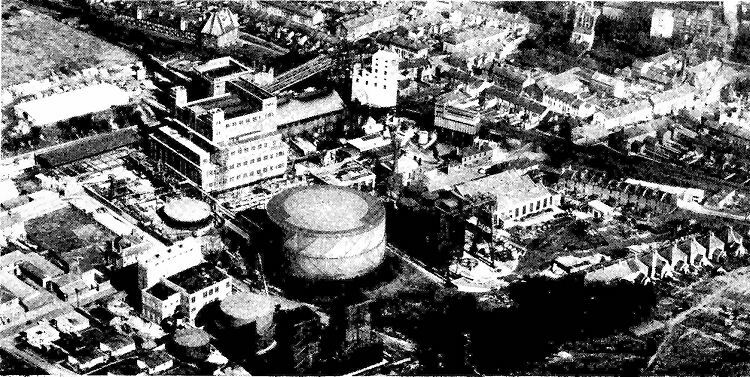 A low-level aerial view of the old gas works in Coombe Valley Road as the complex appeared in the late 1940s and before the plant was greatly enlarged and modernised in the 1950s. Near the gasholders in the foreground is the Primrose Hall public house. The main Dover to Canterbury railway line runs across the centre of the picture and the main street is near the top of the picture with Mannering’s Mill fronting on to it on the extreme right. In 1949, just before the reconstruction began, the Coombe Valley works had an output capacity of 1.75 million cubic feet a day. New plant which had been installed in 1925 gave the works an excess capacity and the opportunity was taken to lay an 18-inch steel main to Adisham to link up with the recently created East Kent Grid. The reconstruction approved in 1949 was designed to give the Dover works the capacity to replace the plants at Deal, Folkestone and New Romney and to supply the East Kent Grid, Further expansion was approved late in 1954 and supplies were then extended to Ashford, Faversham, Canterbury, Herne Bay and Thanet. 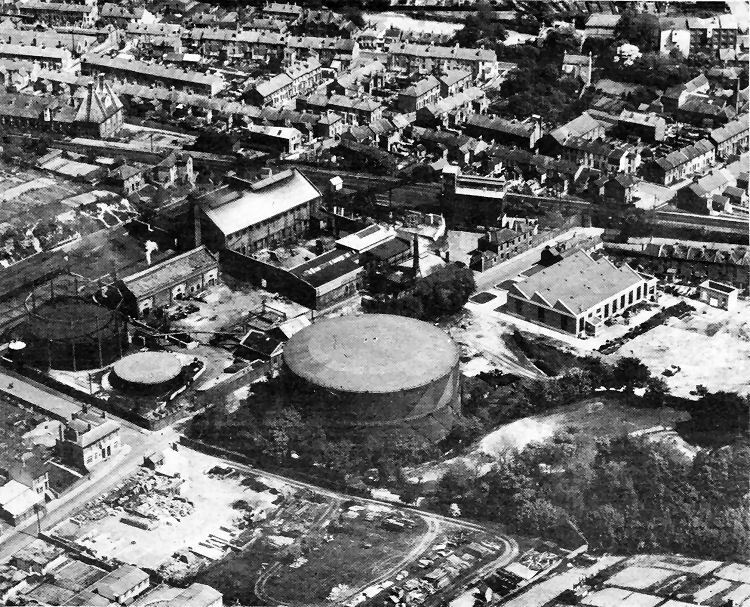 The aerial view of the modernised works below dates from 1955.